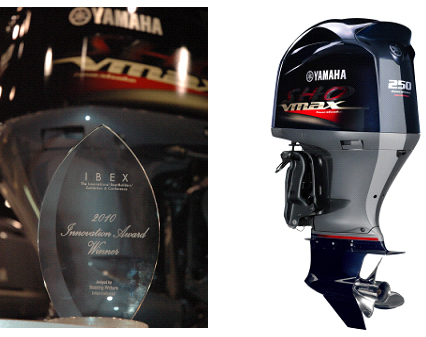 VMAX SHO Series 4-stroke Outboard "VF250" Received US National Marine Manufacturers Association's "Innovation Award" - News Releases | Yamaha Motor Co., Ltd.
VMAX SHO Series 4-stroke Outboard "VF250" Received US National Marine Manufacturers Association's "Innovation Award"
The VMAX SHO series "VF250" four-stroke outboard motor manufactured by Yamaha Motor Co., Ltd. for bass boats (US market export model) has received the "Innovation Award" IBEX 2010 international marine trade show organized by the National Marine Manufacturers Association (NMMA) from September 28-30, 2010 in Louisville, Kentucky. This award not only recognized the outstanding performance, advanced technology and environmental friendliness of the VF250 but also the pioneering efforts of Yamaha Motor to develop a 4-stroke model for the bass boat category that until now has been dominated by 2-stroke models. All this has won high praise for the new VF250 in the advanced US marine market. The VF250 is the top model of the VMAX SHO series of 4-stroke outboards designed and engineered specifically for freshwater bass fishing boats, a category where anglers expect engines to power their boats at speeds in excess of 100 km/hr. The power unit is a newly developed V6 engine with a displacement of 4,169cm3 with the industry's first large-bore sleeveless cylinder manufactured with advanced thermal spray technology to increase displacement while also reducing weight and improving heat and abrasion resistance. Furthermore, the adoption of a variable camshaft timing system, ECM (Engine Control Module) for comprehensive running control and other technology has dramatically improved combustion efficiency, thus achieved outstanding power and torque with excellent fuel economy at the same time. The VF250 was praised as a revolutionary 4-stroke engine with the exceptional speed performance demanded in the bass boat category while achieving lightness comparable to or exceeding that of the existing 2-stroke models and maintaining the inherent 4-stroke strengths of environmental friendliness, fuel economy and quietness. The IBEX Innovation Award is judged and awarded each year at of the IBEX (The International Boat Builders' Exhibition & Conference) marine trade show organized by the National Marine Manufacturers Association (NMMA). This year, awards were presented in 13 categories, including Boatbuilding Methods & Materials, Mechanical Systems, Inboard Engines, Outboard Engines and the Environmental Award. The award selections are made by a judging committee of technical experts from Boating Writers International (BWI). The judging criteria are that the products show innovative distinction from other products currently being manufactured, provide benefit to the marine industry and/or consumer and that they have good practicality and cost-effectiveness.